Under the Charter Home Rule form of government, the County Council may enact local laws, ordinances and/or policies. Certain types of laws cannot be enacted by the Council and must be enacted by the State legislature. Dorchester County is one of nine counties in the State of Maryland that are governed under Charter Home Rule. 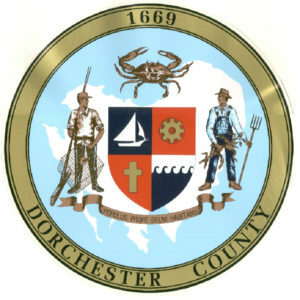 Dorchester County’s Seal was officially adopted by the County Council in 1967 and was designed by Andrew Tolley, a local high school student. The seal depicts a waterman holding a pair of oyster tongs and a crab pot facing a farmer holding a cornstalk and pitchfork. At the top is the popular “bluecrab”. The center shield is divided to show county interests, sailing, religious heritage, industry and shorelines. In the background is a map of the County surrounded by blue water. On the small banner under the shield are written in Latin “Populus prope deum habitans”. A translation for these words would be “people living under the care of God”. The gold banded border of the Seal is imprinted with the County’s name and 1669, the year the County became a unit of government. District #4 George L. Pfeffer, Jr. The County Council also serves as the Roads Board and The Board of Estimates for the County. The County Council appoints a County Manager. The County Manager serves at the pleasure of the County Council and performs all the duties and services required by law or order of the County Council and serves as the day-to-day manager overseeing all County departments and operations. The County budget is established each year by the Board of Estimates in conjunction with the County Manager, Director of Finance and various department heads. The budget is approved by the County Council. The County’s fiscal year is July 1st through June 30th.